Kibbet Batata one of the famous traditional Lebanese appetizer, these potato croquettes are usually stuffed by meat and onion but you can make it with a different filling as you like. This recipe is with mozzarella and spinach. In a fry pan over medium heat add olive oil, and sauté chopped onion until translucent, add minced meat and sauté for 10 minute or until meat becomes dry, add spring onion and spinach basil pesto and sauté until blended. Add 7 spices and Knorr Chicken Stock Powder, set aside to cool, once cool add mozzarella. In a bowl combine bulgur and mash potato, add onion and knead mixture until just starts to stick together. Add flour, Knorr Chicken Stock Powder, spices and dry mint, continue knead by hands until homogenous malleable paste is achieved. Add little water if needed. Have already a bowl of iced water to wet hands. 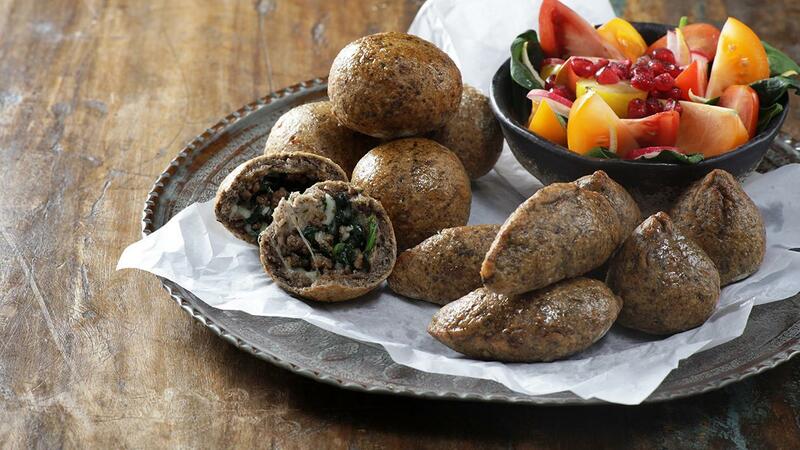 Divide kibbeh dough and stuff by filling equally then roll into balls, try to sharp sides. Refrigerate until ready to use or freeze for future use. In a deep fryer at 180°C, fry the shells are evenly golden brown color and crispy. Alternatively brush the shells with olive oil and bake in a pre-heat oven 190°C for 20 minutes.